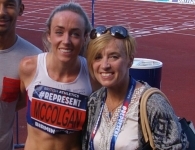 Ellish McColgan is a middle distance athlete for Great Britain who competes in the 3000m steeplechase and the 5000m. Having competed at the London Olympic Games in 2012, Eilish went on to reach the final of the 5000m at Rio 2016. Eilish is the daughter of GB running legend Liz McColgan who won a silver medal at the 1988 Seoul Olympic Games in the 10,000m as well as Gold in the 1991 Tokyo World Championships. Having coached Eilish since the age of 12, Liz and Eilish now have a long distance coaching partnership as Liz lives in Qatar running her own athletics club and Eilish trains and competes around the World. Alongside her elite running career, Eilish founded her own online coaching organisation ‘Running Made Easy’ alongside her partner Michael Rimmer, also a successful GB endurance runner, having represented GBR at three Olympic Games himself. Congratulations on reaching the final of the 5000m at Rio and for being part of your second Olympic games. How did your experience and performance compare with London? It was quite a lot different to my experience in London because for me London was such a step up in competition. I had gone from competing at races around Scotland with my last race before being the Scottish University championships in Grangemouth – there would have been about 20 people in the stands maximum! To then get selected for the Olympic Games and get thrown into a stadium with 80,000 British fans, it was a huge shock to the system! London was one of the most amazing experiences I will probably ever have as an athlete. I was also lucky to have competed at the Glasgow Commonwealth Games in 2014 which the London Olympic Games had prepared me for. Rio was a compete contrast to all of that, the stadiums were not really empty, but there was a lot less people there than at the London Games. There was no people shouting may name and only small spots of GB flags in the crowd rather than it being dominated by them. In a way, that probably helped me performance wise because it felt like just another race so it put me in the mind set of ‘right I’m here to perform’ and not get scared by thinking of it as the Olympic Games. Of course the Olympic Games is still the pinnacle of the sport, so it is what you train for day in day out, but it definitely wasn’t the same as London! You had a bit of a rough time at the end of 2016, as initially British Athletics had decided not to fund you. How did it feel being overlooked for funding even though you had achieved everything they had asked of you and how does it feel now knowing that you have had that decision over turned? Obviously at the time I was disappointed because I felt like I had hit all the criteria and that I deserved my spot amongst everyone else. It was frustrating because I’d had such a difficult year with injury and still managed to come back and perform better than I had before. But at the same time, I had to realise that this is the real world and there is always going to be disappointments; you aren’t always going to get things the way you want. It doesn’t stop you doing what you love, injury and illness are far worse barriers to overcome, and I have overcome those. I am happy now of course that the decision was over turned and I am excited to be part of the programme and to feel that my achievements are being recognised. I’d like to ask you about the influence of your Mum on your athletics career; do you think you would have become an elite athlete if your Mum hadn't been an athlete? And what has it been like having your Mum coaching you throughout? My Mum has coached me for so many years now that there isn’t just one thing that I can pick out, but having someone close to me that has been there and done that is huge. She has achieved everything that I would love to achieve, she has done it all! Because of that, she has also been through all the bad stuff that goes with it, i.e. injuries and illnesses and having to fight and come back. That’s one of the main things I’ve needed form her, because I have been injured a lot and I’ve got her there to be supportive and tell me not to give up. ‘It might seem tough at the moment, but you can come back from this!’, she always says. My Mum has been guiding me along the right path and kept supporting me when things don’t go my way. Right the way through since being12, my Mum has been the one beside me the whole time. Although she lives in Qatar now and I live in the UK, we only see each other once or twice a year now. Our relationship has changed because of that from when I was younger and she was there 24/7, but I’m an adult now and can deal with things on my own. I am very independent with the way I train anyway which means I don’t need my hand holding all the time. My Mum knows that as my coach, if she sets me a programme, I will get on with it and that’s that. So it works really well and we have a very good relationship. Have you ever noticed that your Mum being a female coach was / is often the odd one out at events or training sessions etc? To be honest I have never noticed it. I suppose because she is my Mum as well as my coach I’ve never really thought to much about it. There aren’t that many female coaches out there, if you were to ask me to name you an endurance coach that was female, I would struggle. I know Helen Clitheroe is starting to do a bit more coaching, but apart from that I honestly wouldn’t have a clue, even when I think of the sprints and other events! But it’s not something that I have ever really thought about to be honest, I suppose because it’s always just been me and my Mum, we have never really had any input from anyone else. People have obviously tried to come in and change that, but I am happy with my Mum being my coach and I am more than happy to stay the way we are because it works well. You do quite a bit of coaching yourself as well as establishing your own coaching organisation ‘Running Made Easy’. What inspired you to do that? I enjoy going along with my Mum to her club and helping out with the kids. I also do a lot of school talks and workshops etc. But because I am still competing, I don’t have the time to physically be there at a track coaching at the moment. I know that once I have retired I am sure I will end up getting a small group and coaching a few people. I would love to be able to give people the experiences I have had and pass down the knowledge my Mum has given me (and also my Mums partners knowledge who is also an endurance coach). I’ve been around some of the best coaches in the world and I think I have learned a lot from that. But at the moment, as I said, I don’t have the time to be there and actually give the hands on attention they would need, so that was my thought process of online coaching and founding ‘Running Made Easy’. When I set it up, I wasn’t a funded athlete so it gave me a chance to earn a bit of money and continue to do the sport I love. It’s been quite an exciting thing for me and my partner, because we both have such a wide range of athletes. We have one girl doing an 800m and a couple of others doing marathons, so its such a huge difference in distances, but it’s surprised me just how much I have enjoyed doing it. It has been nice to see how people have improved just by helping them with a little bit of structure and support. A lot of people go online and they download generic templates and try to follow that, but it makes a big difference having someone there planning your sessions day to day. It has been lots of fun. How does your online coaching work? We do it through a training app, they download an online app for free and we link our account to there’s. We upload their training for them as their coach and they log what they have done for the day. We can then look at it whenever we need to and can change things if necessary. The main thing is that we can communicate with them on there on a daily basis. We make sure that we are helping them fit in their training around their normal life as they have jobs and everything else to manage, they aren’t full time athletes like myself. It has been really interesting to do. It’s all online which is great for us because when we are away training etc, we can still monitor them and can constantly communicate with them. What tips or advice would you give to a coach working with young endurance athletes that are hoping to make a career as an elite athlete? I think the main thing for me would be to make sure they aren’t training the young athletes like adults. Don’t push them too hard, which is one of the reasons why I think I have stayed in the sport. I remember as a kid my Mum used to restrict my training days, I used to just run one day a week, then moved on to two days a week. I was quite good as a 12 / 13 year old, and naturally quite talented…and when I got to about 15/16, a lot of the girls where starting to train like adults and pushing themselves quite a lot. My Mum kept limiting me as to how many days I would train and my performances started to dip. I remember crying and crying wondering why I wasn’t improving and everyone else was, but she always said to me ‘it doesn’t matter what you do as a junior, it will matter what you do as a senior.’ As a kid, thats the last thing you wanted to hear because all you want to do is run all the time and win medals and come home with trophies, but now looking back, my Mum was right to do that. A lot of the girls that were breaking the records and winning the medals etc as juniors have all burned out, quit the sport or become injured so they have dropped out. There are very very few that have gone on from competing at 12 right through to my age of 26 and competed at two Olympic games as I have. There are not many that have done that and reached the senior level. I think that is purely because I was stopped from doing too much. I also think its important to create a social group. I was lucky that growing up, it didn’t feel like training. I used to go along on a Tuesday and Thursday night and we had such big group of kids all my age and then go to the cinema or parties at the weekends together. It was like a big family, rather than training, we loved it! If someone couldn’t go one day you would feel gutted because you missed out on all the chat! I always think the best way to keep kids interested in sport is to get them in a group of other kids of a similar age, it makes it much easier for them to stay in contact with the sport. Why do you think there is such a lack of female coaches at the elite level? Coaching in the UK is volunteer based, so a lot of people have families and have jobs. A lot of women have to fit everything else in and then try and coach on top of that. There definitely needs to be more development from the governing body. There needs to be help for women to go into coaching. I am still a full time athlete trying to get to Tokyo 2020, so it isn’t something I have massively thought about too much. But coaching is something I will do in the future, I will go down to my local track and start up a little group, but at the moment I am sticking with online so I can do as much as I can from a distance because that’s all I can commit to at the moment. What I find interesting is that you have the desire to coach. So many female athlete have no interest in coaching when they retire, they don't consider it or they actively don't want to be a coach. Do you think it’s because you have seen your Mum go from athlete to coach, so it just seems a natural thing to do or is it something that you have felt quite passionately about? I have watched my Mum do it, but I have also watched my Mum struggle in the UK because she couldn’t get a coaching job out there. Although she has run for years very successfully, she maybe didn’t have the qualifications to get a paid coaching job. She now lives in Qatar and has been fortunate to set up an athletic club out here which has allowed her to create a job for herself as a coach. So it is her full time job, the same way it is her husbands as well within the same club. I have seen the work they do and it’s so great. I went down to the club the other night and it was my Mum’s husbands 50th and all the kids had got him a cake and made cards and it was actually quite emotional just to see how much every single kid was so grateful. It was such a nice thing to see. In Doha, if you are an international kid and not from Qatar, there isn’t really that much for you to do, so it was nice to see how appreciative they are of what my Mum and her partner do for them and that they are making a bit of a difference to their lives. I would love to have that job satisfaction, knowing that you are making a difference to the next generation coming through. It’s not all about trying to find the next Usain Bolt, it’s about creating kids with healthier lifestyles. It’s about creating the foundations for them to continue as adults. Thank you for taking time to chat and allow a selfie with junior athletes in St. Moritz – if inspiring a new generation of healthy girls is your goal – you are certainly doing it!